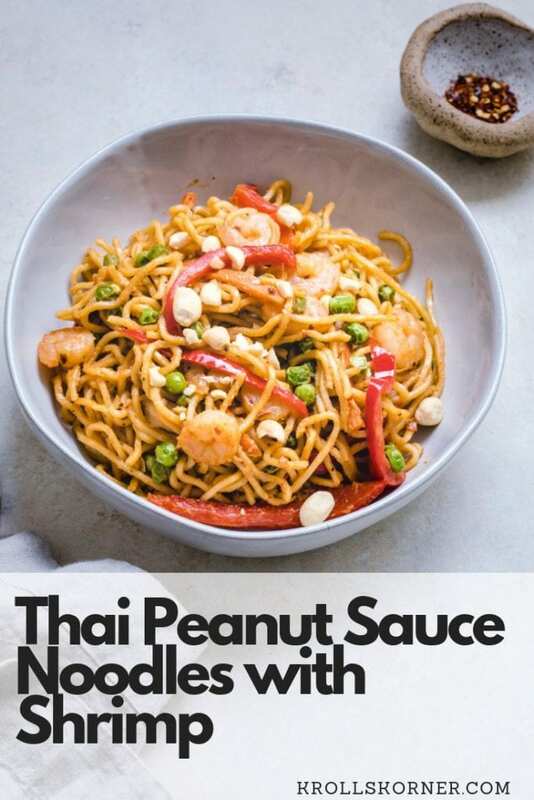 Don’t dine out at your local Thai Restaurant tonight because you can easily make these Thai Peanut Sauce Noodles with Shrimp right at home! I have been a busy woman these days. (What else is new?!) From conferences to work trips and all things in between I have barley had time to stop and smell the roses! September flew by – I was in Utah, New Orleans, I turned 27, and painted the kitchen cabinets WHITE! yayyyy! With the kitchen under construction for 2 weeks it was literally impossible to cook anything. The FIRST thing I made back in the kitchen were my gluten free Pumpkin Muffins and the second was this amazing and easy Thai Peanut Sauce Noodle recipe! I received a wonderful package from the National Peanut Board and threw up a poll on Instagram stories seeing what recipes y’all wanted to see me make with all things peanuts and Thai Noodles took the lead! You really do drive my content – I wouldn’t be here if it wasn’t for you – so bless your heart for wanting some Thai Peanut Sauce in your lyyyyfeee! I am going to be honest with you – I don’t eat Thai food often. Or dine out at Thai restaurants very often. But, I feel as if this dish is top chef worthy. Like, I was literally salivating waiting for it to be done it smelled so good. I mean, the Thai Peanut Sauce along I could stick a straw in a slurp it up! Let’s dive in to making Thai Peanut Sauce! I like to get all of my ingredients out on the counter, measure them out and mix! No need to separate into smaller bowls like shown in the photo below, just use 1 mixing bowl. 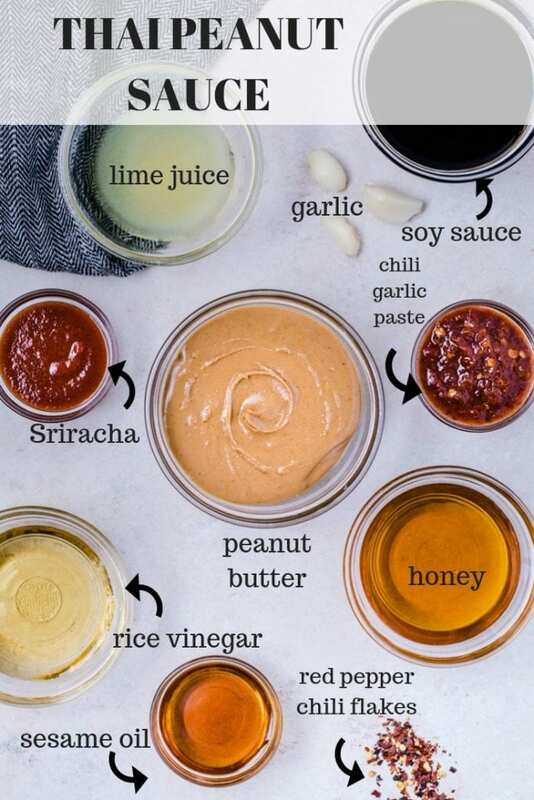 This sauce recipe makes 1 cup of Thai Peanut Sauce! 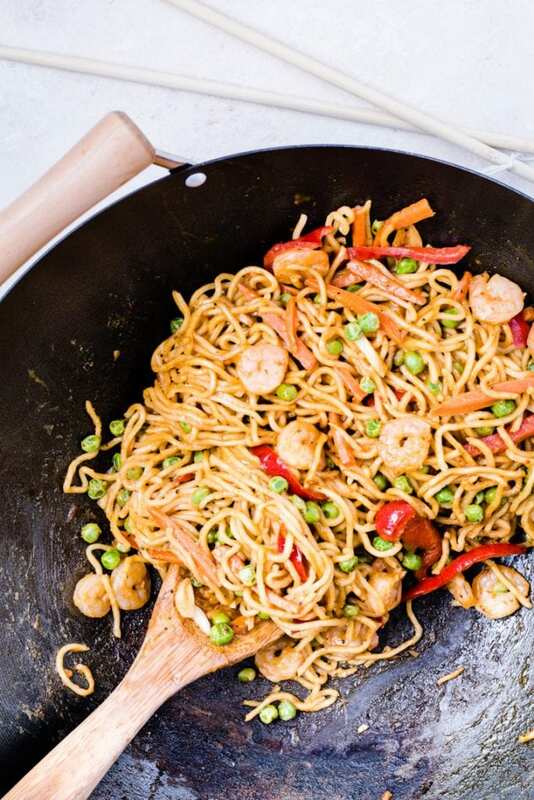 It’s good with pretty much any stir fry recipe! Goes very well with any noodle dish. You can use it in a cold noodle salad and it goes great with sliced chicken breast & chopped cilantro on top! You can take my Asian butter leaf lettuce recipe and swap out the Asian sauce for this Thai Peanut Sauce! Kebabs or Spring rolls are great uses of this sauce too! Is Thai Peanut Sauce Gluten Free? If you make sure your soy sauce is gluten free, then yes! 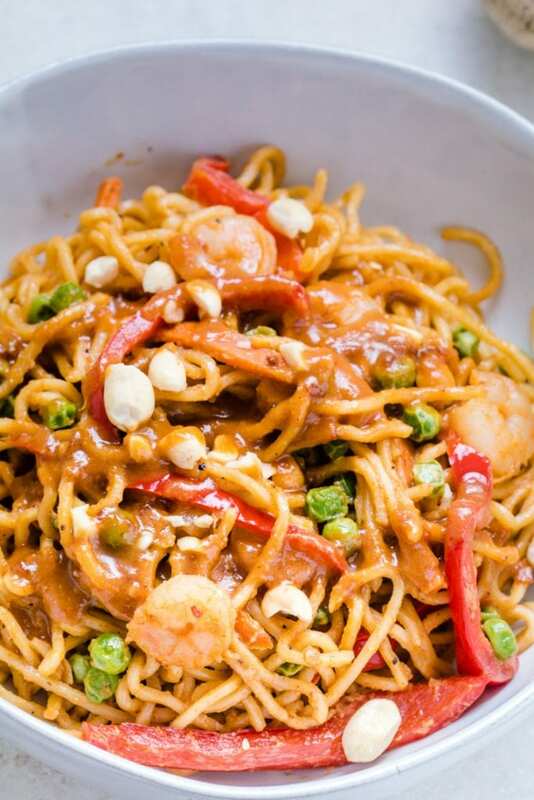 PIN THAI PEANUT SAUCE NOODLES WITH SHRIMP FOR LATER! If you like this Spicy Thai dish, you’ll probably also really enjoy these Kung Pao Noodles! They are spicy and delish either hot OR cold! I like to top it with green onion right before serving so they don’t get mushy in the fridge. If you like sesame oil, you’ll be sure to really love this recipe! You can even toss some grilled chicken on top too and it would round out the meal nicely! 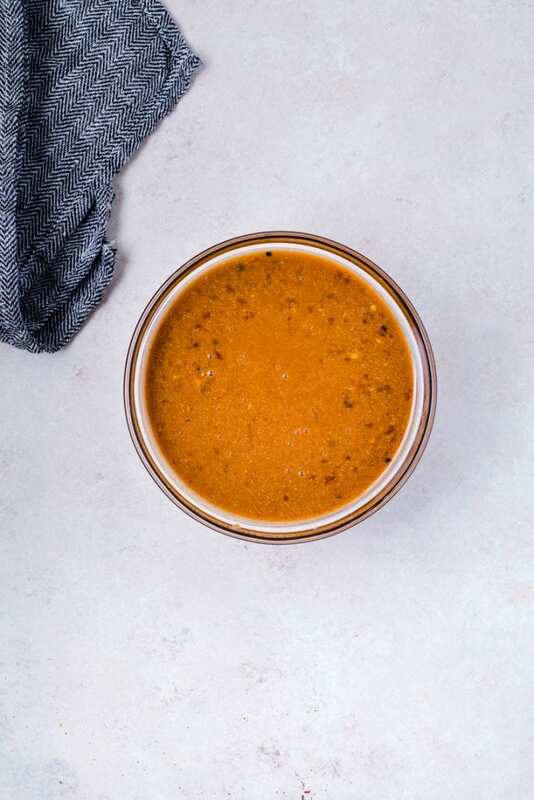 This Thai Peanut Sauce is satisfying, easy to make and a perfect meal to add to your weekly menu planning! First make the Thai Peanut Sauce. Gather all ingredients and whisk together in a medium sized bowl. This recipe makes 1 cup Thai Peanut Sauce. Set aside. Then, in a wok or large frying pan heat avocado oil over medium high heat. Once hot, add in carrots & bell pepper. Cook for about 5 minutes, stirring occasionally. I like to add in a little Thai peanut sauce in here with the veggies too! Then add in shrimp and noodles, and cook for another 4-5 minutes. Once shrimp is cooked, add in 1/2 cup sauce and peas! Start with 1/2 cup of sauce, and continue to add more if you feel like you want more! Garnish with chopped peanuts and enjoy! You can use rice noodles, ramen or even brown rice in place of the stir fry noodles. Also, feel free to sub shrimp with a different protein of choice: tofu or chicken are yummy options! Be sure to tag @krolls_korner on Instagram if you make this recipe! This sounds incredible! I’m all about anything peanut butter! This thai peanut sauce is MONEY!!! Guuurrrrrrllll I’ve been putting it on EVERYTHING! Thank you! I just love this sauce recipe. I will have to try it! Thank you so much! Hope you love it! I am a sucker for anything “Thai peanut” 🙂 Yum! Right?! Same team!! Thank you! Nothing better than peanuts! Love this! 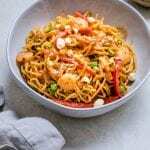 I am always looking for a new recipe with shrimp in it, this Thai peanut sauce with noodles and shrimp will be great for dinner! So simple and delicious! Great week night meal. I’ve never made peanut sauce myself but your directions were so simple and it turned out so good!! My new favorite dish!! Perfect substitute! NEVER too much haha! Thank you! I just made this for dinner, and it was the most amazing past night! So happy you enjoyed it for din, it’s such a great weeknight meal! Yum! I made something just like this the other day. I will have to try your version too! That’s great! The flavors are just so good, thank you!